As soon as you get pregnant you will be bombard with everyone telling you how and what you should be doing. It gets old fast. Fortunately in my situation I knew already the choices that my husband and myself were going to make. Nothing is certain, but with my background and knowledge we have a solid idea on the birth we want or at least an idea of what we ideally would like to happen. This brings up a really good point, you have no control. Birth plans written out are a waste of time and will only make you go nuts if they can’t be followed. Know in your heart and in your mind what you want. Even from trying to get pregnant to birth you have no control, but you have options and tools. The best thing new parents can do is know all their options and be educated. Knowledge is power and especially when it comes to birth and bringing life into this world. With that being said I’m very passionate about letting your body do what it is meant to do with little to no intervention. 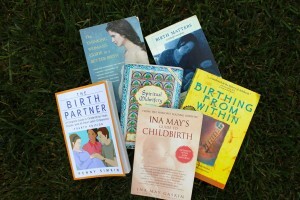 My husband and myself are preparing for a home birth and using midwifes for our maternity care. Not everyone is comfortable with this and that is okay, but regardless of your view points on labor and delivery I highly suggest you read the following books. All will prepare you to have tools and be ready for any type of child birth you may have. All I purchased on Amazon.com for under $7.00. Most women don’t even know they have options outside of a hospital to give birth in. That’s a shame and it’s my hope that you take from this entry the choice to learn all that is out there for mother and baby. The status on US childbirth in hospitals with complications, added harm or even death is alarming. You need to know this so you can ask the right questions of any practitioner you choose to use. Ultimately you have to do what is right for you and baby, but at least have you reasons and understand why you choose certain options. Don’t just do it because that’s what you were told to do. That advice really could be applied to all areas of your life. If you are not a big reader or maybe your birth partner isn’t then there is a fabulous documentary called the “Business of Being Born” -you must watch it. In addition they just did a follow up series you can get on Netflix called “More of the Business of Being Born.” Both great choices if you or your partner are not readers.